The screen uses the same OLED - organic LED - technology as many current smartphones, but encased in plastic instead of glass. Samsung wowed an audience in Las Vegas this week with a working mobile phone screen which can be rolled and unrolled like a sheet of paper. The screen kept working as it was rolled and unrolled - showing off that it is far more flexible than previous 'bendable' screens. The prototype device is built to be "virtually unbreakable", Samsung claims. The device was shown off by Brian Berkeley, senior vice-president of Samsung Display, at a presentation at the Consumer Electronics Show in Las Vegas. “Our team was able to make a high resolution display on extremely thin plastic instead of glass, so it won’t break even if it’s dropped,” said Berkeley. The new display is called “Youm." Berkeley also showed off a smartphone prototype equipped with a curved edge, which works almost like a 'second screen' around the edge of the device. 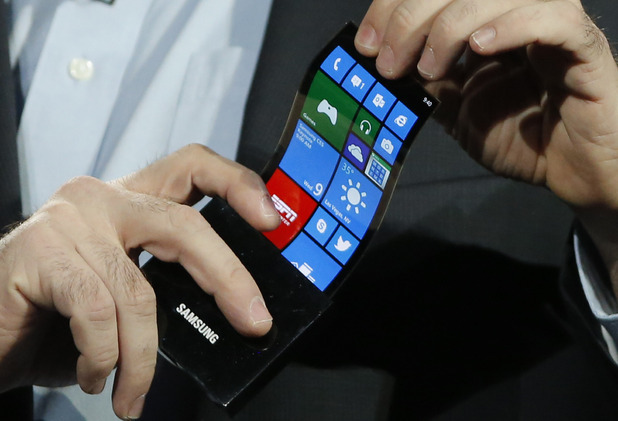 The Korean technology company remained quiet on when flexible phones might go on sale.